My mom and I were discussing dogwoods recently. They’re the state flower for North Carolina and the state tree/memorial tree/floral emblem for several other states (Missouri, New Jersey, Virginia). We’re fortunate to have two pink dogwoods growing in our yard, and they’re in bloom right now, just in time for Easter. I hope you don’t mind if I revisit an old post (from March 2014) this Ash Wednesday. I don’t remember the exact timing of how everything fell into place March 2014, but I’m pretty sure I wrote this post shortly before my husband came home and told me his company was asking us to move. And move we did, all the way across the country. Talk about your seismic shifts. I still find I want to dust myself off when I’m covered in ashes. I yearn for an easy answer and search for that shiny, clean (happily ever after?) place. I needed to revisit this post for myself, and it occurred to me that some of you might welcome this reminder, too? Blessings to you this Ash Wednesday, as we enter into Lent and a season of penitence and waiting for the joyful message of Easter. I had a lighter post planned, but it somehow didn’t seem appropriate for Ash Wednesday, a day of ashes and penance, the beginning of Lent, the time we set aside in the Christian calendar to remember the events leading up to Christ’s crucifixion, the weeks we set aside to draw closer to God in advance of Easter. Last night, I became restless and couldn’t sleep, instead pondering the ways we live in ash heaps and sell our lives and dreams short for 30 pieces of silver. We settle for less than what God has planned and even resort to forcing events in our lives that were not what God hoped for us. Judas Iscariot did this when he betrayed Jesus. Scholars say he was hoping to force Jesus to finally take up his sword and become the warrior Messiah that Judas and others had been awaiting. Judas betrayed Jesus in exchange for 30 pieces of silver, an amount that equaled four months’ wages. Not worth much, considering the outcome for Judas, who tossed the money back at the high priests before going out to hang himself. One of my favorite stories involving betrayal is The Great Gatsby. Did you know that F. Scott Fitzgerald considered naming it something entirely different: Among Ash-Heaps and Millionaires? Fitzgerald recognized, and wanted his readers to see, too, that the separation between millionaires and those living among the ashes isn’t as great as our society might want us to believe. Jay Gatsby was popular and enigmatic but couldn’t escape the ash-heaps and betrayal in the end, despite all that his money could buy. Sometimes we all end up covered in ash. And whether it’s the freeing ashes of penance or the weighed down ashes of our past, we rarely feel comfortable or comforted when covered in ashes. And maybe that’s why we’re quick to sell out, to dust ourselves off for a mere 30 pieces of silver, to think it’s so easy to grab hold of our dreams and get to a shiny, clean place. But is the place we end up as clean and as shiny as we expected? I’ve felt a disconcerting seismic shift in my life in the last few months, as if God is moving the underlying plates in my life, and last night, I wrestled to name the shift. I think it has to do with being covered in ashes from the past (not just my own past but others near me, too) and not wanting to take the 30-pieces-of-silver, forced way out. So I’ll wait to see what God has planned for me next. The waiting here is hard. Just because I’m pondering ashes doesn’t mean I should leave you there, too, right? 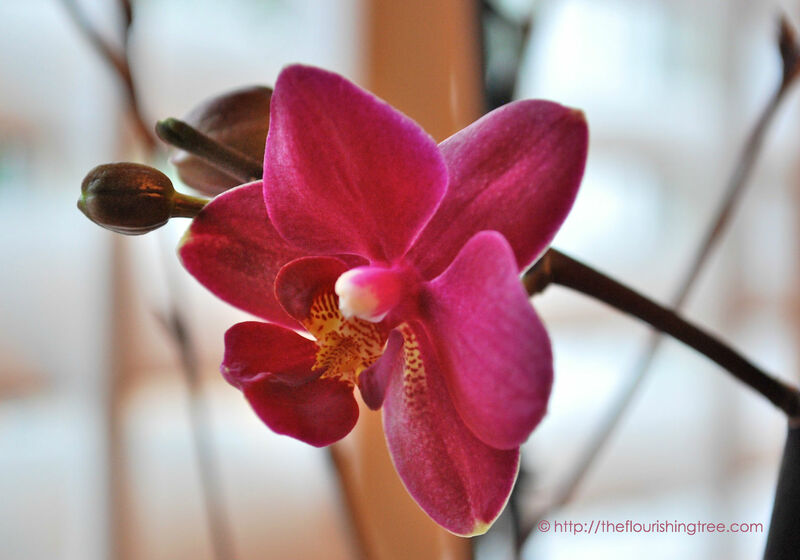 So if you recall last week’s post and my joy of an orchid bud, here’s what happened this week. I couldn’t resist sharing it, even if it has nothing to do with ashes and 30 pieces of silver. It does have everything to do with embracing life, though, and that’s what I plan to do while I’m waiting for God’s next move. Easter has long been one of my favorite holidays. The weekend leading to Easter was always a whirlwind of fun when I was growing up. My aunt, uncle and cousins drove down from Maryland, and we spent Saturday afternoon painting Easter eggs. I can still smell the boiled eggs and feel my burning fingertips as I raced to dapple on the egg dye before the egg cooled too much to hold the paint. Sunday promised homemade bread for breakfast; a spectacular, joyful service; and a race home, where the aroma of lamb and herbs roasting in the oven greeted us before we even got inside. Dad hid Easter eggs, and after the egg hunt, my mom and aunt hid Easter baskets. Eggs and garden flowers are inextricably linked in my memory, especially the pink azaleas that often bloomed right in time to conceal an equally pink egg. 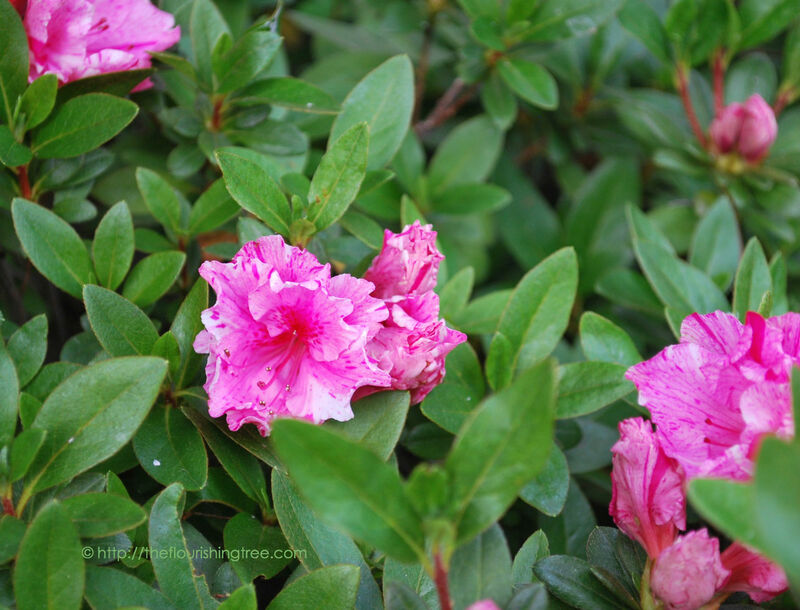 I was a terrible egg and basket hunter, while my brother was always the champion, but I always knew to check the pink azaleas for the pink egg. Somehow, Easter doesn’t feel quite the same without a hunt of some sort. The joys of Easter Sunday always wiped away the somber Maundy Thursday service with its black draped cross, the haunting solo of Where you there when they crucified my Lord?, and the darkened sanctuary. At this point in Holy Week, we have the somber moments yet to remember and ponder before we celebrate the joyous Easter. And as I look around at my own garden blooming, I am reminded of the two Easter gardens: one of darkness and betrayal, the other of light and joy. Tomorrow will mark the point in Holy Week when we revisit the darker garden, the garden full of grief and trembling and betrayal, the Garden of Gethsemane. When Jesus spoke had spoken these words, He went forth with His disciples over the ravine of the Kidron, where there was a garden, in which He entered with His disciples. Then Jesus came with them to a place called Gethsemane, and said to His disciples, “Sit here while I go over there and pray.” And He took with Him Peter and the two sons of Zebedee, and began to be grieved and distressed. To read the full events of that night in the garden, read Matthew 26:36–56. The upshot is this: Jesus asked his disciples to stay awake while he went a little ways off to pray. He begged God to change what was about to happen, but Jesus also submitted to God’s will. He scolded the disciples for falling asleep in the face of his distress. He prayed again; they slept again. Judas and the soldiers arrived to arrest Jesus, and the disciples fled. But Mary was standing outside the tomb weeping; and so, as she wept, she stooped and looked into the tomb; and she saw two angels in white sitting, one at the head and one at the feet, where the body of Jesus had been lying. When she said this, she turned around and saw Jesus standing there, and did not know that it was Jesus. Jesus said to her, “Mary!” She turned and said to Him in Hebrew, “Rabboni!” (which means Teacher). I love John’s account of Mary mistaking for Jesus for the gardener. Her eyes and brain and heart weren’t ready yet to see the risen Jesus standing in front of her, alive, in the garden. Are your eyes and brain and heart ready? I’ll leave you today with a tour of my Easter garden. Most of these flowers I can identify, but I need your help with one of them. I hope you enjoy them. May these blooms remind you of the joy of Easter. 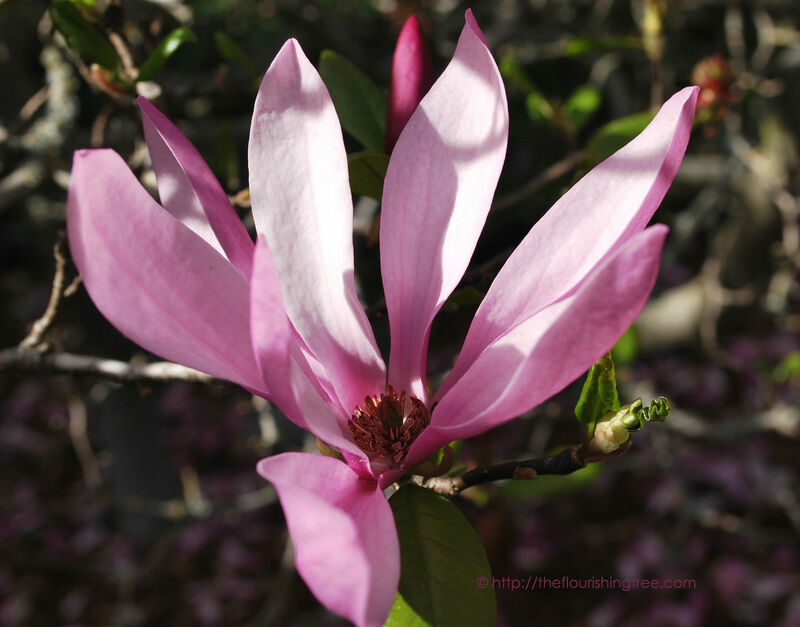 A few blooms still remain on the tulip magnolia, but some days, it looks as though the tree sneezed and shed many of its blossoms. I was delighted to see that some gardener before me had planted pink azaleas here. Yay! An iris blooms amid a mass of leaves. 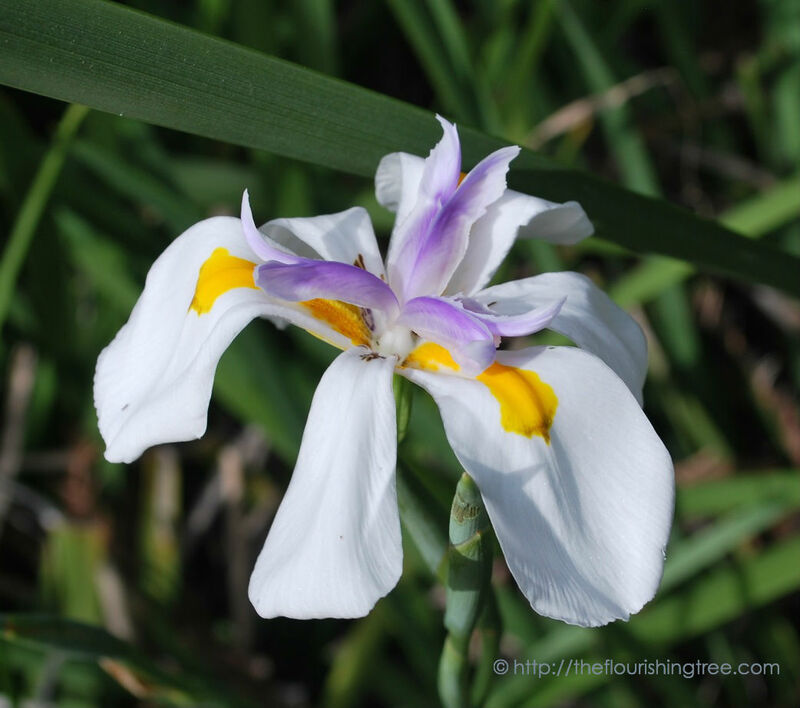 The clump of bushes is taller than other irises I’ve seen, and so I was surprised to discover this bloom. I’m enjoying the almost daily surprises in my new Easter garden. The Jerusalem Sage I planted recently is now blooming. You can see the second whorl starting to bloom, too. 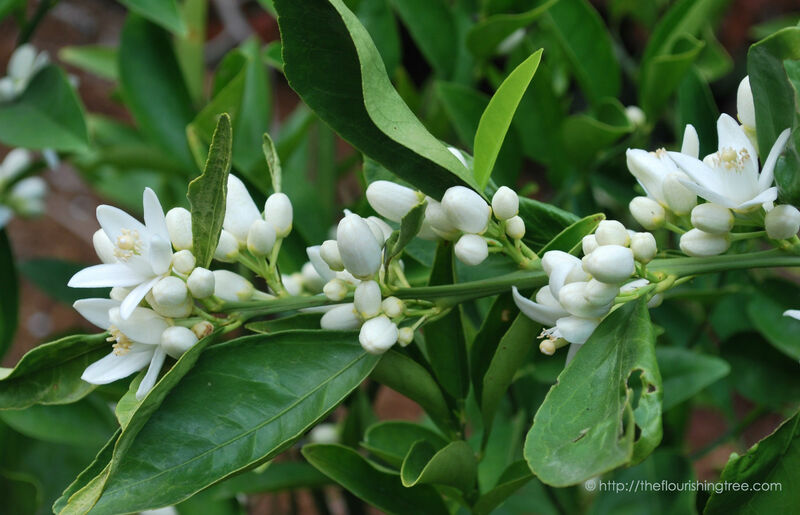 We still have a few oranges left to eat, but the trees are already beginning to flower. Any idea what these are? I’m enjoying their red/yellow and pink/white color combinations. Happy Easter, my friends! 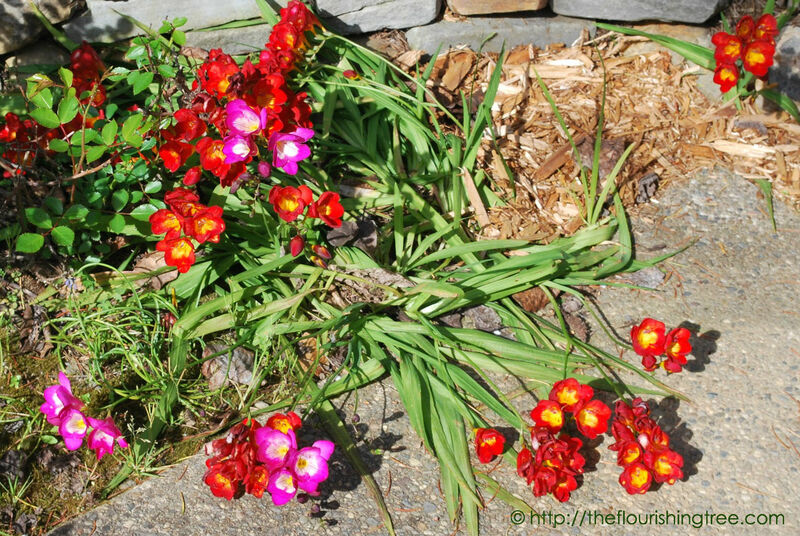 I’d love to know what’s abloom in your Easter garden and how you celebrate the joyous day.